Replace existing concrete coating on any industrial floor or commercial floor always begins with a complete evaluation of the existing concrete floor. A concrete coatings specialist from Concare will need to understand your current operation. How is the existing concrete floor being used? Does the floor need chemical protection from chemical spills? Are any of the chemicals flammable? Are there areas of your concrete floor exposed to high temperatures or low temperatures? Is your concrete floor exposed to forklift traffic, front end loaders, or metal fragments? 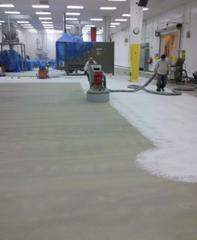 Does the floor need static protection against dry environment that contain dust or powder? Does the concrete floor need anti-microbial protection to help control the growth of microbes? Does your floor need sloping or pitching? If you are ready for your existing industrial concrete floor coating to be replaced by a proven contractor, contact Concare for an evaluation. Now that Concare understands how your current concrete floor operations work, and we are aware of how you want to use your new concrete floor coating, we can begin to recommend the best concrete surface preparation methods. Years of accumulation of old concrete floor coatings, contaminations and worn areas on the concrete floor will determine the concrete floor removal preparation so the new concrete floor coating bonds to the surface. If you are ready to have your existing industrial concrete floor coating replaced by a proven contractor, contact Concare for an evaluation.